The roots of Cherne Contracting Corporation began in 1916 when Tony Cherne founded the Buhl Plumbing and Heating Company in the rugged mining town of Buhl, Minnesota. Buhl prospered at the turn of the century with the discovery of iron ore. Tony Cherne took advantage of the business opportunities provided by the thriving mining industry by directing his newly formed Buhl Plumbing and Heating Company through the bidding, award and execution of a $174,000 mechanical contract for Buhl's municipal heating plant. 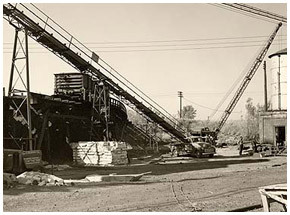 Small projects associated with the mining industry carried Cherne through the early years. This 1940's vintage construction site at the Buhl Power Plant is representative of the work Cherne pursued during this period. Cherne continued to build his reputation through the successful completion of projects across Minnesota's Iron Range and in 1923 opened a branch office in the Michigan Upper Peninsula town of Ironwood. Although these areas provided a strong beginning for the upstart mechanical contractor, by 1926 the region's construction boom was ending and in 1927 Tony Cherne moved his operations to Chicago. Cherne prospered in Chicago performing mechanical work for industry-leading corporations that included Illinois Bell Telephone, the University of Chicago and Chicago Coke By-Products Company. Unfortunately, the prosperity was short lived. The thriving industrial expansion gave way to the Great Depression and Cherne, weary from the struggles of the difficult economic times, returned to Buhl in 1931. The Cherne-Carlson Company was located in Ironwood, Michigan just up the street from the local Texaco gas station. Little did Tony Cherne know that decades later Texaco would become a Cherne Contracting client. As jobs were very hard to come by during the Depression, Cherne worked long hours journeying back and forth between Buhl and Ironwood fighting for what little work there was. In 1935 he transferred operations to the Cherne-Carlson Company, a newly formed partnership with ten-year employee Charles Carlson. As the economy was once again improving, the Cherne-Carlson team bid projects all over the area, focusing on work for the mines, hospitals and schools. 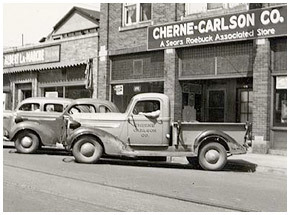 In 1945 Charles Carlson left the Cherne-Carlson Company. In just a few short years Tony's son Albert would complete his college studies at the University of Minnesota and join his father working together under a new enterprise, The Cherne Company, Inc.